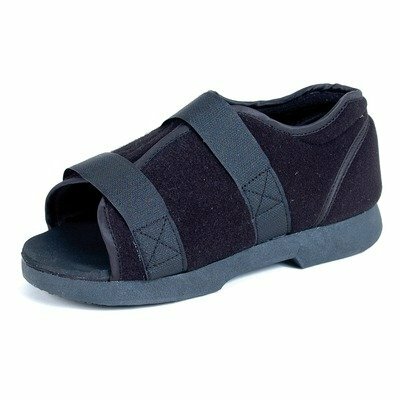 18018 Size: Xlarge, Gender: Men Features: -Soft top post-op shoe.-Available in men and women genders.-Cotton-poly blend upper allows the patient's foot to breathe and provides added comfort.-Designed specifically for recovery after soft tissue procedures, post trauma, or to relieve the geriatric or insensitive foot.-Contact closure system provides even torsion and is designed for ease of use.-Large size fit to 9'' - 11'' men's shoe and 9''+ women's shoe.-X-large fit to 11.5'' - 14'' men's shoe. Options: -Available in X-large, large, medium and small sizes. Dimensions: -Small size fit to 4'' - 6'' men's shoe and 5'' - 6'' women's shoe.-Medium size fit to 6.5 - 8.5'' men's shoe and 7'' - 8'' women's shoe. Warranty: -6 Months warranty. Supports/Braces - Large Foot Plate for rivet on splint.